It also illustrates a use of initial capitals (to use the term very loosely, since it’s an initial word) that you can’t achieve with either XSL-FO or CSS. You could do it manually with XSL-FO by using side floats to push text out of the way of the initial “Type”, and even creating that would need a few iterations if you’re going to correctly optically align the stem of the “T” with the left edge of the text block. You could, of course, argue that the aesthetics would have been better if the “Type” was slightly smaller so that the bottom of the descenders on “yp” aligns with the baseline of the third text line. 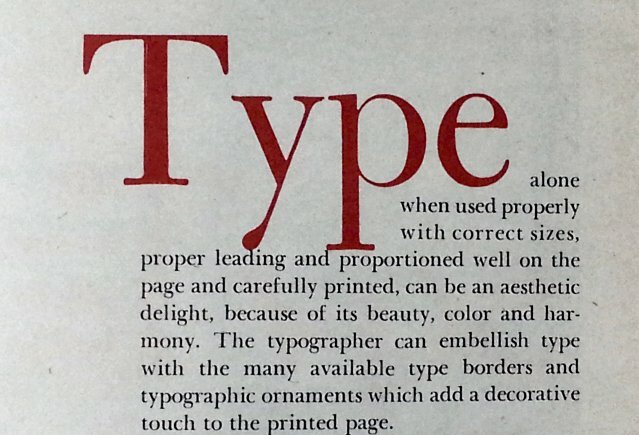 However, we’ll never know whether the “Type” is the size it is because that was the best size available or if, for the sake of aesthetics, they pushed the size of the “Type” to the maximum to minimize the white-space between “Type” and the “alone” on the first line.